One of the world’s most popular cars is going full-electric and with the might of the Volkswagen Group behind it, it will be a force to be reckoned with. 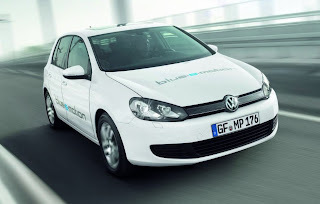 The Volkswagen Golf blue-e-motion electric car will initially be available as a five-door, five-seater driven by a single electric motor housed in the usual front engine compartment. The electric powersource will produce a maximum 85 kW (continuous power output of 50 kW) and a healthy 270 Nm of torque from the get go. Powering the Golf is a lithium-ion battery (26.5 kilowatt-hours) that is made up of 30 battery modules each with six lithium-ion cells. The technology allows for a 150km driving range which according to Volkswagen is sufficient enough for most people’s driving needs. Nonetheless, the German company says the production version which goes on sale in 2014, will have a ‘significantly improved’ driving range over this concept. Much like Toyota Prius’ in-car systems, the Golf blue-e-motion allows the driver to see how much energy is being demanded at any given time. However, the Golf does it with a kW gauge which has replaced the traditional tacho. Drivers can also select three different modes: maximum range, maximum comfort and maximum dynamics. This will then set how much power the electric engine will output plus control energy going to air conditioning systems. In comfort mode it gets all 85kW so that it can hit the 135km/h topspeed. Put it in Normal and that comes down to 65kW (115km/h). If you’re really keen for maximum range, you can reduce power to 50 kW and deactivate the aircon. Charging takes place via a typical plug connector hidden cleverly behind the VW logo on the radiator grille. In total the electric version of the Volkwagen Golf weighs roughly 200kg more than the standard five-door, five-seater version (1,545kg).